Author Manny Pacheco’s faithful fascination with the Studio Era’s character actors is enjoying wide acclaim. 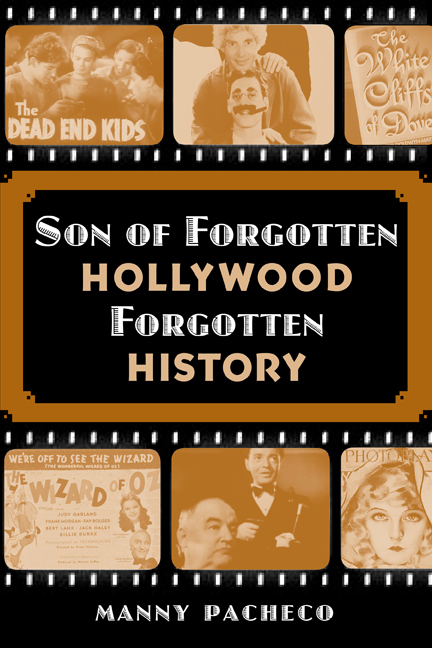 Forgotten Hollywood Forgotten History has been added to the prestigious shelves of the Library of Congress and Main Branch of the Richard J. Riordan Los Angeles Public Library as a reference copy. Vision4Media has agreed to develop Pacheco’s book series into a documentary. The Hollywood production company is considering theatrical and television opportunities. The weekly Forgotten Hollywood radio program can be heard on 90.1 KBPK FM on Sunday at 7p (pst). Pacheco also hosts a web-based television show on the THERAPYCABLE CHANNEL. You can puchase Son of Forgotten Hollywood Forgotten History – right here. Click on the BUY NOW button on top of the Navigation Bar, or visit the Book Premium Stores to find where to buy the paperback. With 21 featured actors, and rarely-told uniquely American stories, this is the perfect holiday or celebration gift.